Beta testers using iOS received a notification on Friday that an update to the Waze app would be available on TestFlight in the near future. Identified as "RC v.4.43.4.0" in a message posted to Twitter by Chris Harper, the version seems to be a release candidate, but it is unknown when it will formally launch to all users. Arriving as part of iOS 12, which was recently confirmed to ship on September 17, the update to CarPlay will enable third-party apps that provide navigational assistance to function through the vehicle's infotainment system. The support effectively provides the same features found on the iPhone and iPad versions, but projected onto the infotainment unit's display, with the third-party tools able to offer features that Apple Maps does not. 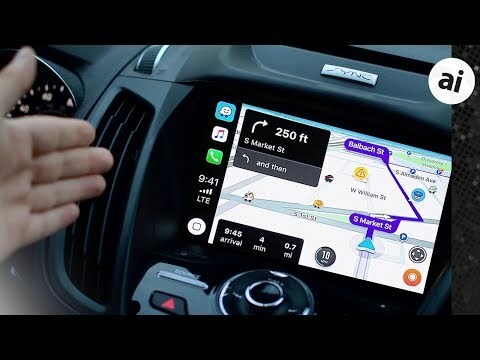 In Apple's announcement of CarPlay's third-party navigation support at WWDC in June, the image of the CarPlay dash interface featured three apps, with Waze and Google Maps being the most well-known of the trio. Unlike Waze, there is no word on when Google Maps for iOS will include iOS support, but it is possible for the popular service to issue an app update soon after iOS 12's launch to enable it. For Waze, the confirmation of a release candidate beta on TestFlight is a good sign that it will arrive in the near future, though again there is no indication for when it will be. Along with enabling other navigational services in CarPlay, Apple is also replacing its externally-sourced mapping data with its own in-house data for Maps. The new data was originally limited to users in the Bay area, before rolling out to the rest of California then to the rest of the United States. Other smaller performance updates have been found in relation to audio apps, with AppleInsider testing revealing quicker start-up times regardless of audio app. AppleInsider said: Apple is also replacing its externally-sourced mapping data with its own in-house data for Maps. The new data was originally limited to users in the Bay area, before rolling out to the rest of California then to the rest of the United States. "...starting only with data for San Francisco and the Bay Area, expanding to the rest of Northern California by fall 2018. It’s expected to continue across the United States for a full year, section by section." I don't know if it's been mentioned here yet that the entire change over should only take about a year. That's pretty quick tho the project has been underway for four years now, sourced from both Apple mapping vans and users own iPhones. I was an iPhone user for 10 years, until when I bought my first car with Carplay/Android Auto (a Honda Fit) early this year. After just two months (and an e-mail directly to Tim Cook addressing my concerns), I finally gave up and switched to an OnePlus and could not be more happy with my decision. Unfortunately, Carplay/Siri experience is way, waaaaay behind Android Auto/Google Voice Assistant, even with iOS12. With Android Auto I have a nice home screen with weather forecast and notifications, Waze, Google Maps, SMS, Messenger, Whatsapp and Spotify. Siri (specially in my country) is absolutely dumb in comparison to Google Voice Assistant. As more and more cars will be sold with integrated screens (and let's not forget home assistants), I think Apple should really rethink Carplay really fast, or it risks losing some significative market share ahead. And yet, according to J.D. Power, "In the smartphone mirroring battle, drivers using Apple CarPlay report significantly higher satisfaction with the system than those using Android Auto." Whether one prefers CarPlay or Android Auto is really a personal choice and it will be different for everyone. Once Google Maps and Waze is available on CarPlay, CarPlay customer sat will be even higher than it is now. I think they both work right about as expected: Users can connect their phone and interact with a familiar interface that will allow them to make calls, send/receive texts, play media and most importantly use their favorite GPS/NAV software. Personally I wouldn't trade my iPhone for any Android phone, no matter how great the voice assistant in Android Auto worked. Outside of using voice to make the occasional call or directions to location.. I just dont need to talk to the voice assistant that much while driving. My wife purchased a 2018 model year vehicle with both CP & AA last year. Out of pure curiosity I purchased the cheapest new Android phone I could find that supported AA ($190 Motorola G5 plus). Rather than pay for a second line of service, I tethered that G5p to my iPhoneX and played around with all the features of AA. While I agree Google voice assistant works better than Siri.. and on pretty any platform.. being able to use Waze on the car's "big screen" is what was most attractive. And even that wore off after a couple months of tethering. In the end Android Auto just wasn't enough of an amazing experience to keep me invested and after a couple months I got rid of the Motorola G5p. If anything the whole Motorola Android phone + Android Auto experience made me use CarPlay even more. And most surprisingly what I've discovered is that Apple Maps has improved greatly. For a few months whenever I queried directions in Apple Maps, I'd also fire up Waze or Google Maps on my iPhone just to see just how well Apple Maps worked. I'd say about 95% of the time Apple Maps used the same routing as Waze/GM and the ETA was exactly same. Eventually I got to the point where I now use CarPlay + Apple Maps.. without double checking Waze every time I drive her vehicle. Apple Maps + CarPlay = now works so well I have no real complaints left. That said I do still look forward to using Waze + CarPlay and will be purchasing my own vehicle with CarPlay some time later this year. Im just waiting for 2019 model year vehicles to hit the lot, as it seems silly to purchase a 2018 this late in the year with 2019s (and their new features) headed to dealer lots. Waze does a few things that still make it the premier GPS/NAV app.. things like locating cops/speed traps/cameras and notifying you of accidents & hazards. TL:DR version: Google Maps + Waze + CarPlay = is what most iPhone users want. You can keep the Android phone + Android Auto. Even with Google Maps and Waze soon to be available on CarPlay, search is going to be driven by Siri. This is still going to be a crippled system compared to Google Maps and Waze on Android Auto, where Google Assistant shines in the car. Apple has so much cash and so much engineering talent (supposedly). Why is Siri so limited and plain dumb? Those who have never tried Android Auto don’t understand how infuriatingly limited and dumb the CarPlay experience is compared to Android Auto. I’ve been using both in the past 1.5 years, and there’s no comparison. Two CarPlay issues are inferior Maps and inferior voice assistant. The inferior maps will soon be solved by allowing Google Maps and Waze on CarPlay. The inferior voice assistant will remain on CarPlay. Sygic is a great navigation app. I've been using it through Ford's Applink with my iPhone but it's going to be great to have native CarPlay support. I'd like something in-between the two. Apple Maps often takes me on weird routes (that a driver who knows the area wouldn't take). Waze takes me on a bit too many experimental paths (little neighborhood streets to try and shave a minute, etc.). Maybe having better data will help Apple, but there is still the problem of actual 'intelligence' in how it decides on the route. Apple has so much cash and so much engineering talent (supposedly). Why is Siri so limited and plain dumb? This question could be asked about so many things these days. Maybe it takes a lot of people resources to keep up with fashion? As I keep saying, if basic 1990s search functionality is lost on most Apple products, what makes us think they will do well at more complicated things like machine learning, or so-called artificial intelligence? Just got a new Pioneer AVIC-W8400NEX Wireless Car Play head. Very happy with it although a trifle pricey. One question someone here will surely be able to answer I have is ... I assume updates to Car Play software are all iPhone side and the unit is passive in this regard? Correct. That's one of the attractions about CarPlay compared to built in the apps for the head unit. That would have been my hope, but why then, do some manufacturers (BMW?) now charge an annual fee for Car Play for ongoing development? Because they can. The same reason iPhone prices keep going up and up.